In Edgar and Lucy, author Victor Lodato often uses the symbolism of stars, especially Betelgeuse. Betelgeuse is a star in the Orion constellation, one of the most easily recognized groups of stars in the night sky. Orion's Belt consists of of three stars (also known as the Three Kings or the Three Sisters). Betelgeuse, officially termed Alpha Orionis is visible above and to the left of Orion's Belt, marking the hunter's shoulder, and is the second brightest object present in the grouping after Rigel. In other cultures the star is associated with the leg of a running stag (ancient India), the leg of a cayman or turtle (Brazil); part of a ceremonial drum (Japan), or one of four vultures about to devour a criminal (Peru). Most sources seem to agree that its name has Arabic origins; "elgeuse" refers to the historic Arabic name for Orion, al-Jabbar or al-Jauza, meaning the Giant or the Mighty, while the first part has been variously translated as arm, hand or armpit. The first written mention of the star is recorded as "Beldengeuze" in a 13th-century Spanish table commissioned by Alfonse X, King of Castile, that was used to calculate the position of the sun, moon and planets relative to fixed stars. Stars are classified by heat and luminosity under the Morgan-Keenan (MK) system developed in the 1940s. Heat is indicated by the letters O, B, A, F, G, K and M, with O being the hottest and M the coolest. (Mnemonics are used to remember the list such as "Oh Be A Fine Girl Kiss Me"). Interestingly, this seemingly random classification of letters has to do with the fact that originally stars were given a letter based on the amount of hydrogen that could be observed (A, B, C, etc.). This led to a huge number of designations. In 1901 a science assistant, Annie Jump Cannon, realized that it made more sense to order stars by heat, not hydrogen content. As her system was adopted the letter designations remained but were simplified from 22 to 7 and their order got scrambled to reflect the new organization. Luminosity, or brightness, is graded with Roman numerals from I to V, with I being the brightest. Betelgeuse is considered a Class M-I red supergiant with a surface temperature of approximately 3200 °C (5800 °F)  which is only about 60% of our own sun's surface temperature (a G-type star - often colloquially known as a yellow dwarf). Although Betelgeuse is significantly cooler than "Old Sol," it's also incredibly bright  approximately 100,000 times brighter than our sun - because it's simply so large. It's so immense in fact that if it were placed in the center of our universe, with a radius of 850 million kilometers it would extend beyond Jupiter. Betelgeuse is only about 10 million years old, which is quite young for a star. Its mass is so great, however, that it's burning its fuel very fast, and astronomers expect it to exhaust itself within the next million years or so. In comparison, our 4.5 billion year-old Sun hasn't even reached middle age, and is expected to continue providing light for at least another 5 billion years. When Betelgeuse runs out of fuel, scientists believe it will collapse into a supernova and explode, at which point it will appear as bright as the moon and may be visible during the day. Supernovae do produce deadly gamma rays, but at about 642 light years away from Earth they will be harmless to anyone on Earth. After that, it is expected to continue compacting into a neutron star (the smallest and densest type of star known) and may ultimately form a black hole. 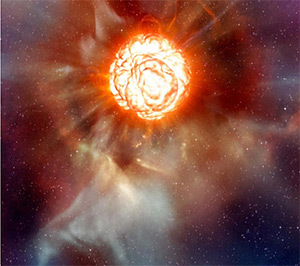 Image: An artist's impression of Betelgeuse showing the violently boiling surface of the supergiant star, as revealed by observations with the European Southern Observatory's Very Large Telescope. This "beyond the book article" relates to Edgar and Lucy. It originally ran in April 2017 and has been updated for the February 2018 paperback edition.